In need of some easy, breezy tunes to liven up your summer playlist? Swedish folk band First Aid Kit has just what the doctor ordered. The folk sister act featuring Johanna and Klara Soderberg will again bring their ethereal vocals and country-tinged music to The Late Show with David Letterman Thursday night. Though Johanna and Klara are only 23 and 21 years old, respectively, they're old souls, crooning about men who done them wrong, loss, and regret. Pretty heavy stuff for a couple of girls who grew up singing along with Britney Spears and Christina Aguilera on the radio. The duo first rose to international fame when their cover of Fleet Foxes' "Tiger Mountain Peasant Song" racked up views on YouTube in 2008. Since then, they've released three albums, their latest of which, Stay Gold, just dropped on June 10. They won the Nordic Music Prize for Best Nordic Album of the Year in 2012, picked up some Swedish Grammis that same year, and Rolling Stone named their single "Emmylou" one of the best of 2012. All of these accolades are well deserved. 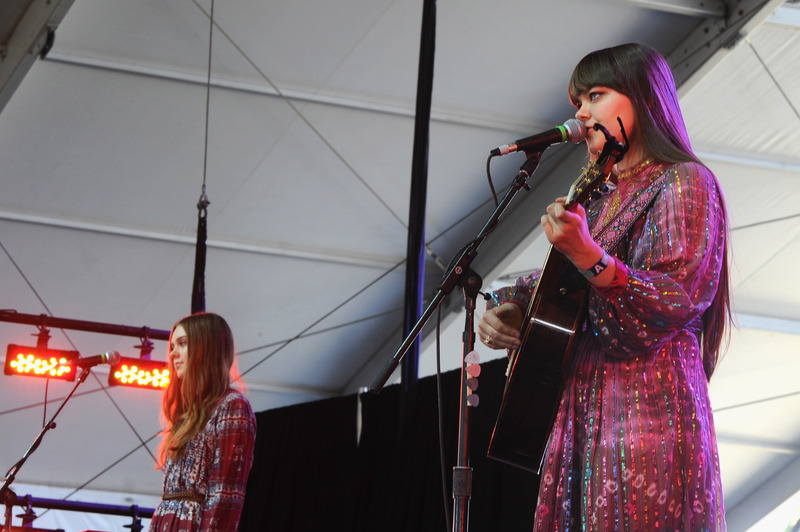 First Aid Kit's haunting yet innocent vocals and harmonies like buttah cut to your core and invite you to at least try to hum along. They're also pretty much the coolest people ever who look and sound like they took a time machine from 1970 to 2014. If you feel like your soul needs some healing, First Aid Kit will do the trick. And now we've got just what the doctor ordered: a crash course in all things First Aid Kit. Doesn't it feel good? Aw, teenage Johanna and Karla. Don't you want to just pinch their cheeks? The reissue of First Aid Kit's first EP Drunken Trees features three songs performed live in a Swedish forest. Many of their music videos were also filmed outside and have a strong, natural vibe to them, sometimes even resembling an episode of True Detective . When they're not performing, the Soderberg sisters still love to be in the great outdoors, taking photos in the snow, near the ocean, and in the desert. They list some of their influences as '70s singer-songwriter Gram Parsons, '50s country duo The Louvin Brothers, and '80s electro artist Gary Numan. Singing "I'll be your Emmylou, and I'll be your June/If you'll be my Gram and my Johnny, too" on their single "Emmylou," they even pay homage to some famous country music duos they admire, Emmylou Harris and Parsons and June and Johnny Cash. The Song You'll Be Hearing A Lot This Summer: "My Silver Lining"
Those harmonies though. And has there ever been a better use of an owl in a music video before? We think not. Their time touring with Conor Oberst looked like a blast with nail painting parties and jam seshes. These ladies have incorporated the '60s and '70s folk style into their music, and they dress the part, too. With their long hair, maxi dresses, hats, oversized sunglasses, and colorful prints, First Aid Kit exemplifies the boho chic style. The Saddest Song with the Happiest Music: "Blue"
The lyrics say, "You're just a shell of your former you/That stranger in the mirror/Oh, that's you/Why'd you look so blue," but the music sounds as cheerful as a music box. First Aid Kit is always cracking little jokes in the captions of the photos they post to Instagram. It even looks like they Photoshopped Justin Bieber into one and said what we were all thinking. Just look at how Klara plays the keys. Fierce.